Our study on saplings was conducted in six forested sites in three southern Michigan counties: Ingham Co. (three sites), Gratiot Co. (two sites), and Shiawassee Co. (one site), with 10 to 60 km between sites. Data set one - on the fate and density of emerald ash borer larvae and associated parasitoids on ash saplings from both biocontrol-release and non-release control plots in southern Michigan during the three-year study (2013–2015). Data set one was used for calculations and associated analyses for of the parameters presented in Figure 1, 2, 3, and 4. Data set two - on ash tree abundance (per 100 m2) and healthy conditions (or crown classes) at the six study sites in southern Michigan observed in summer 2015. Data set two was used for estimation of tree density (Figure 5) and healthy condition (or crown classes). These are raw data collected according to methods described in Duan et al. (2017) - Forest Ecology and Management (in review) and can be used to study population dynamics of emerald ash borer (EAB) and associated natural enemies on ash saplings as well as ash abundance and recovery in the aftermath of EAB invasion. These data were collected in Southern Michigan, the epicenter of emerald ash borer invasion with specific methods and sampling times. EAB population dynamics and associated natural enemies observed on sapling trees may not be generalized to large ash trees. Duan, J., Bauer, L., & Van Driesche, R. (2017). 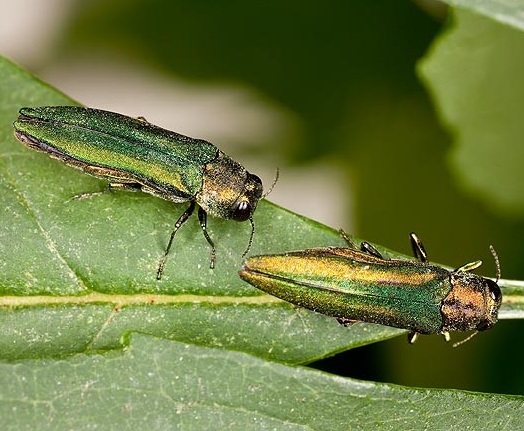 Emerald ash borer biocontrol in ash saplings: The potential for early stage recovery of North American ash trees. Forest Ecology And Management, 394, 64-72. Duan, J., Bauer, L., & Van Driesche, R. (2017). Emerald ash borer biocontrol in ash saplings: The potential for early stage recovery of North American ash trees. Forest Ecology And Management, 394, 64-72.